We said it before and we’ll say it again, there is so much natural beauty surrounding the city of Abbotsford. Fishtrap Creek is beautiful and natural with it’s trees, peaceful waters and abundant wildlife. The moment you enter the trail you are greeted by amazing tall trees creating a canopy of green overhead. As with most of BC’s forests, our trees are incredibly majestic and often ignored by locals since we have grown accustomed to their beauty. Our challenge to you is to stop and reflect on their beauty, if for just a moment. When entering the trail you are gracefully greeted with various tall trees hovering protectively over the trail, standing tall with branches reaching majestically towards the sky. Their shadows partly shading the walking path, but not completely hiding it from the sun, allowing the visitor to walk both in the shade and in the warmth of the sun. A sense of peace floods my being as I gaze far down the path, admiring all the beauty of nature; looking all around I come across a clearing in the bush where I can see the creek. Skirted with an abundance of plant life and the surface covered in billowing lily pads, the serene waters extend far into the distance. With many creek side benches and lookouts, you could sit, rest, relax and enjoy all Fishtrap creek has to offer for hours. Watching the ducks and ducklings play in the water, seeing geese land and take off as well as many other smaller beautiful birds float around, it is pretty amazing. 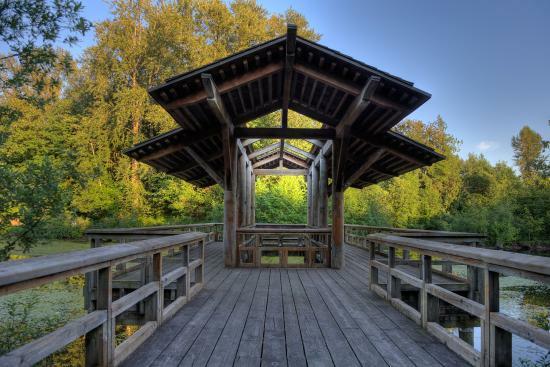 This park is very close to the heart of the city of Abbotsford and yet when you enter it, you feel so far removed from the hustle and craziness of modern life. You get to replace the noise of traffic with the sound of wildlife and the brushing of the wind through the trees. It’s an amazing park, and it offers so much and believe it or not, it’s free. Who said nothing in life is free! Come out and enjoy it’s solitude and the natural surroundings of Fishtrap creek park. So close to the city, yet with the sounds so far removed; the noise of cars replaced with the melodic chirping of birds and bustling of crowds replaced with the rustling of mysterious animals in the bushes; presumably rabbits. Careful where you place your feet and tread gently, in this great place to admire the beauty of planet earth; at any moment a creature, be it rabbit or squirrel, may scurry out in front of you. The beauty of Fishtrap Creek is not unlike the rest of British Columbia, in its trees that surround and engulf the park and the waters that so peacefully beckon the wildlife to play. The North Basin is the site of historic bridge pilings from the Abbotsford Lumber Company Train route. Many lookout points & picnic shelters overlooking the creek. Discovery Trail signs, map & wetland bird habitat information. There 31580 Maclure Road Driving Instructions: Heading East on Highway 1, From Vancouver: Head eastbound on Trans Canada Highway #1 take Exit 83 for Mount Lehman South/Fraser Highway West. Keep left at the fork, follow the signs for Fraser Highway East and merge onto Fraser Highway. Continue onto Maclure Road. Multiple parking lots accessible to Fishtrap will be on the right, off of MacLure Road. Heading West on Highway 1, From Chilliwack: Head westbound on Trans Canada Highway #1 take Exit 83 for Fraser Highway East. Merge onto Fraser Highway and continue onto MacLure Road. Multiple parking lots accessible to Fishtrap will be on the right, off of MacLure Road.